Hollington United Football Club is gearing up for successive matches against its two title rivals. 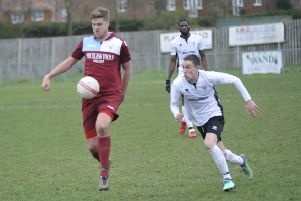 Third-placed Hollington will travel to Balcombe in the Mid Sussex League Premier Division tomorrow (Saturday) before hosting second-placed Cuckfield Rangers next weekend. Hollington are three points behind Balcombe with two games in hand and trail Cuckfield on goal difference having played the same number of matches. Hollington’s hopes were boosted by Cuckfield suffering a surprise 2-1 defeat at home to ninth-placed AFC Ringmer last weekend, a result which Hollington manager Scott Price said left the title picture ‘wide open’. The Lions are currently on a 12-match winning run in all competitions, which has included reaching the Sussex Intermediate Challenge Cup and Mid Sussex Senior Charity Cup finals. The last game Hollington didn’t win was a 2-1 defeat in the reverse fixture at home to Balcombe on November 24. They exacted revenge in emphatic fashion just three weeks later, however, as Hollington won 6-1 away to Balcombe in the Sussex Intermediate Cup. Hollington have conceded just one goal in their last four matches in all competitions and have kept four clean sheets in their last six. Balcombe are also in fine form having won eight and drawn one of their last nine encounters in all competitions. Hollington United’s remaining league fixtures: March 30 Balcombe (a), April 6 Cuckfield Rangers (h), April 13 Buxted (h), April 20 Peacehaven & Telscombe II (a), April 22 Lindfield (a), April 27 Rotherfield (h), May 4 Sporting Lindfield (a). Mid Sussex League Premier Division top four (played-points): 1 Balcombe 21-52 (+57 goal difference), 2 Cuckfield Rangers 19-49 (+52), 3 HOLLINGTON UNITED 19-49 (+33), 4 Lindfield 19-39 (+37).